Lathom is an area rich in history. It is listed in the Domsday Book and shows that the 360 acres of farmland and 720 acres of woodland, which made up the Manor of Lathom in 1066 almost certainly formed the most important of 17 manors which played a key role in a defensive system of land tenure to protect the emerging kingdom of England from the Norsemen of Dublin and York. There is an excellent website produced by Lathom Trust: they are a group of people who devote much of their spare time researching the history of Lathom. Click here to view. The artists impression of Lathom House above gives a hint to the previous importance of Lathom and the Stanley family, which has now become the Earls of Derby. The village of Lathom actually grew due to the building of the first "Lathom House" which took place shortly after William the Conqueror had his success in the Battle of Hastings in 1066. The first "Lathom" was a man named William who, along with his followers, was a supporter of William the Conqueror. In 1066, all faithful supporters were given just recompense. In the case of this other William, it took the form of vast lands in what is now Lancashire. On this land, William's followers built him a brick house. Although brick houses are the norm in Lancashire nowadays, in 1066 they were a rarity due to the difficulty in making and baking the bricks. Also at this time, due to so many men having the same given name (e.g.” William"), surnames were beginning to appear. Thus it was that William became William de Lothe Hom, or William of the brick house. De Lothe Hom has, over the centuries, finally evolved into the forms commonly seen today; Lathom or Latham. It was in 1385 that Isabella de Lathom, being the oldest daughter of parents who had no male heir, married Thomas Stanley and the Latham and Stanley families became forever linked. The Earl of Derby, since that time, has of course, always come from that particular Latham-Stanley line. It was under the Stanley's Lathom grew to become a seat of power for almost 300 years. 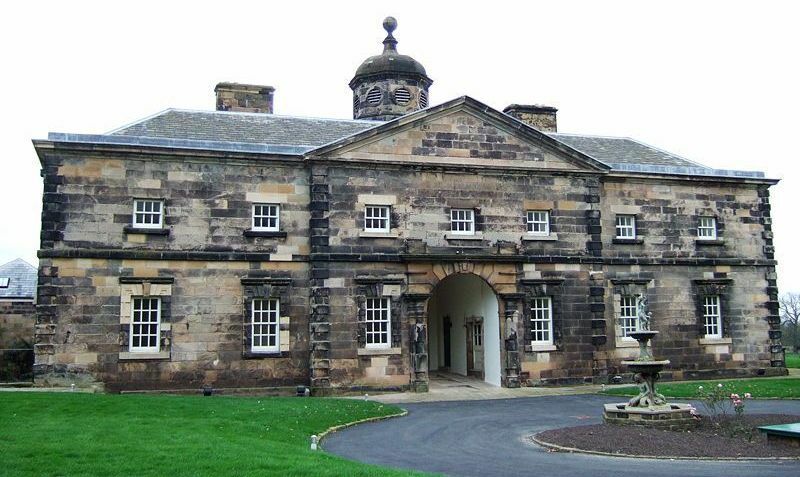 The Siege of Lathom House was a military confrontation between Parliamentary Army and a Royalist stronghold in Lancashire. It lasted from late February to late May of 1644, when the siege was lifted. A loyal Royalist, James Stanley, 7th Earl of Derby, the lord at Lathom House was ordered by Charles I to fortify the Isle of Man against a possible Scottish invasion, and then on to the northern campaign. His wife, Charlotte de la Tremoüille was left in charge of what turned out to be the last remaining Royalist stronghold in Lancashire. Thomas Fairfax saw Stanley's absence as an opportunity to strengthen the Long Parliament's position in Lancashire and set out to conquer Lathom House. Immediately after the fall of Warrington, the Roundheads requested that the countess acknowledge the parliament and surrender her house, but she refused on the grounds that doing so would dishonour her husband. But she offered to limit herself to defending her home, and this postponed further attacks on her position. When Fairfax arrived at Lathom House in February, the countess had made every effort to conceal the strength of the castle's fortifications. Fairfax demanded that the countess surrender Lathom House to him. She asked for a week to consider his offer, and then insisted that it was only appropriate that he visit her at Lathom House for further negotiations. He was received as an honoured guest, but the entire household categorically rejected his terms for surrendering. He gave her two more days to consider her situation. The emissary sent two days later was scornfully dismissed. 9 towers, each with six cannon, three pointing in either direction, and the Eagle Tower providing an excellent overview of the battlefield. In addition, the castle was at the lowest point in the middle of an open expanse that allowed excellent views of the enemy's activities. Lady Charlotte had assembled a militia of seasoned marksmen who were able to inflict significant losses by sniping. The fortifications sustained continuous cannon and mortar fire with minimal damage; in addition, the Royalists were able to launch several successful sorties to disrupt Roundhead efforts to set up shooting positions. As a result, Parliamentary forces were unable to establish any major artillery positions against the castle, and the army refused to replenish those that were lost or spiked during the sorties. Morale among the Roundheads suffered greatly. Fairfax persisted in demanding that Lady Charlotte surrender to his forces, going so far as to obtain a letter from Lord Stanley asking for safe passage for her. She refused to surrender under any terms, rebuking messengers in increasingly disdainful tones. 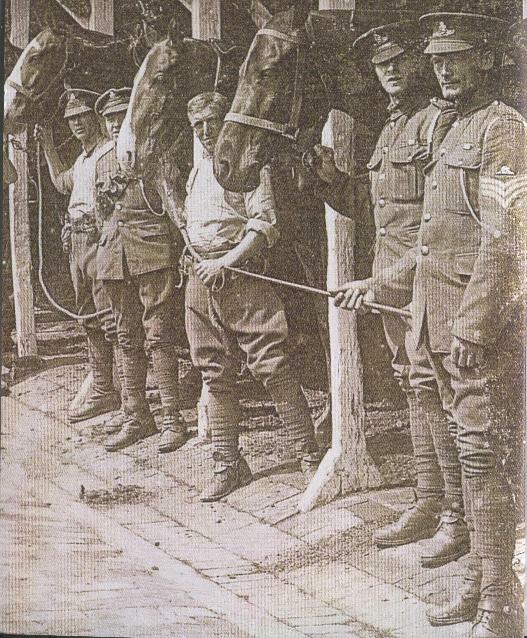 After one particularly audacious sortie in late April that destroyed several Roundhead positions, Fairfax declared a day of fasting and prayer in his camp. One of the chaplains invoked the following verse from Jeremiah 50:14: Put yourselves in array against Babylon on every side: all ye that bend the bow, shoot at her, spare no arrows: for she hath sinned against the LORD. When a messenger from Colonel Rigby of the Roundheads arrived to offer Lady Charlotte an honourable surrender, she threatened to hang him up at the tower gates, then asked him to convey the following while she tore the message: Carry this answer back to Rigby, and tell that insolent rebel, he shall have neither persons, goods, nor house. When our strength and provisions are spent, we shall find a fire more merciful than Rigby; and then, if the providence of God prevent it not, my goods and house shall burn in his sight; and myself, children, and soldiers, rather than fall into his hands will seal our religion and loyalty in the same flames. A similar ultimatum issued by Rigby on May 23rd prompted Lady Charlotte to respond: "The mercies of the wicked are cruel .... unless they treated with her lord, they should never take her or any of her friends alive." The siege was lifted on the night of May 27th as Prince Rupert approached Lathom with thousands of cavalry and infantry. Lady Charlotte and her household departed for the Isle of Man, and in December of 1645 Lathom House was taken and destroyed by parliamentary forces under the command of Colonel Egerton. Knowsley Hall succeeded Lathom House as the principal seat of the Stanley family. In 2004, Lathom House was immortalized by Steeleye Span in the title track of their album, They Called Her Babylon. What is left of the Hall is now converted into apartments and can be seen at the top of the page. The almshouse cottages neighboring the Lathom Hall chapel however remain today. Senior citizens reside in the cottages and the chapel, named for St. John, still holds regular Anglican services.One can see various plaques, etc. in the chapel dedicated to the memory of the last residents of Lathom Hall; the Bootle-Wilbrahams. 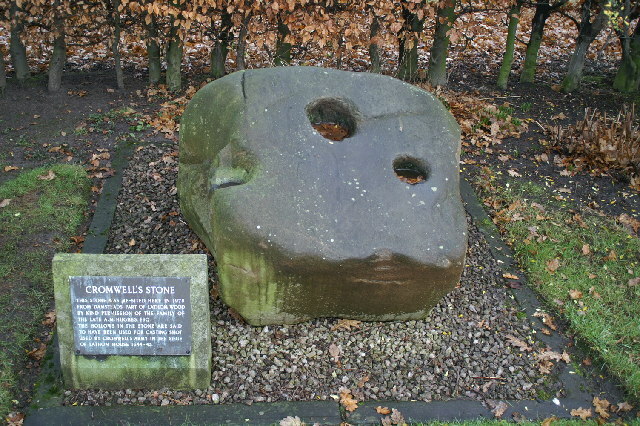 The hollows in the stone are said to have been used for casting shot by Cromwell's army in the siege of Lathom House. 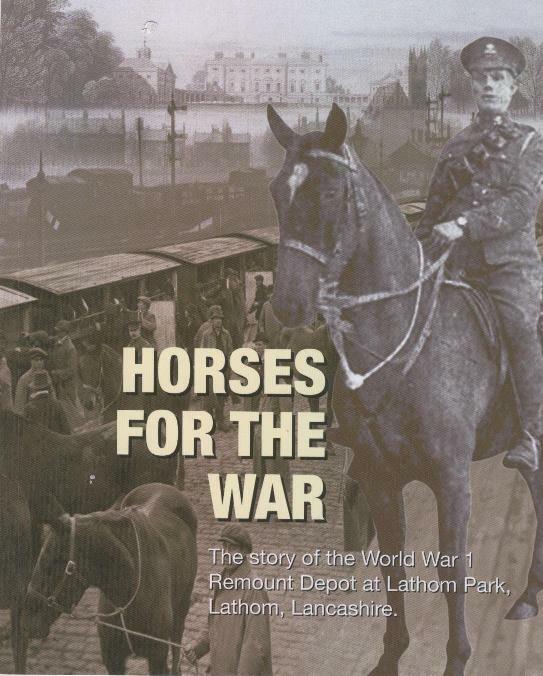 A high quality unique specialist publication by Lathom Park Trust with many contemporary photos.